Check out my Gallery of Food Photography here. 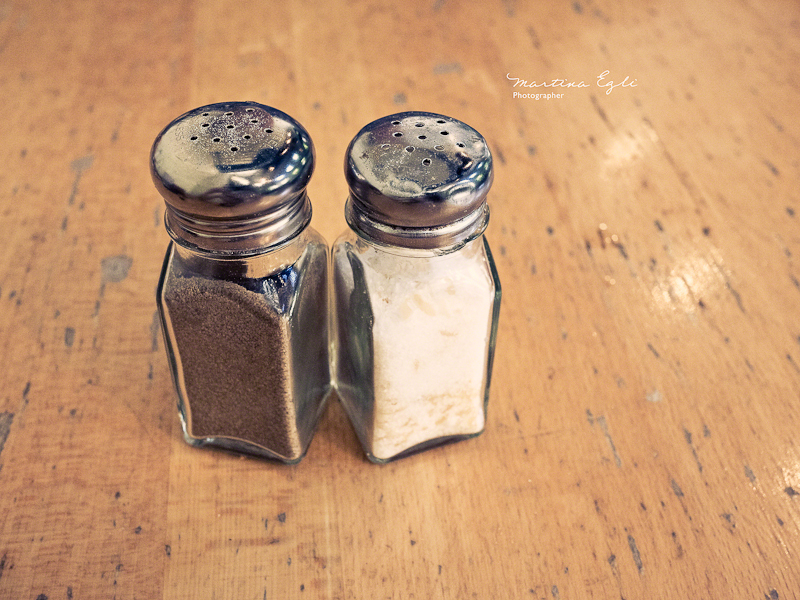 Yes, it does seem a few may have become a little too enthusiastic with the salt shaker. There looks to be grains of rice in with the salt to keep it from clogging so moisture was probably the root cause of this banged up cap — I’ve seen similar dings in so many diners. Nice detail. Simple and very well done, with a nice wood background! The art of photography to my eyes has always been the ability of the photographer to view the world so completely differently to those who spend a lifetime with blinkered eyes, to capture the minutia of detail and interpret things that so many simply walk on by without a second thought. This is the sort of frame I would take (though not as well as you have), and I love the textures, angle and depth of focus, the capture of the reflections in the stainless steel and the residue of granules that tell tales like a scene from a Tarantino flick. A very cool frame that comes from a photographer with great awareness and that certain eye. Wonderful colour treatment – gives something simple such life! Yes, you are so correct. Excellent post! simple, et très bien mis en image. De très beaux détails sur cette macro !